Fried rice is popular in many Asian cultures. If you’ve ever visited any Chinese restaurant, you’ve probably seen it on their menu. Fried rice is a great dish because you can serve it as a side or as the main dish. Our basil fried rice recipe is inspired by flavors from Thai dishes. It uses Thai basil, which is has a unique flavor compared to the basil you are probably more familiar with. The Thai basil pulls out all the characteristics of the other ingredients and creates a fantastic taste with every bite. When you make this recipe for basil fried rice with eggs, you’ll be eating several food groups. You’ll get a great helping of grains with the rice, some delicious veggies and some protein from the chicken and eggs. To learn how to make basil fried rice, follow our easy-to-follow recipe below! Cook the rice. Bring 4 cups of water to a boil. Put in the rice, cover the pot and let it cook for about 20 to 25 minutes, or until all of the water is absorbed. While the rice is cooking, do not remove the lid. Taking off the lid lets out the steam, causing the rice to cook improperly. Prepare the other parts of the dish while the rice is cooking. In a small bowl, whisk the eggs, salt, and black pepper. Set it aside. In a small bowl, whisk together the oyster sauce, fish sauce, and sugar. Set it aside. Heat the oil in a wok until the oil begins letting off smoke. Add the garlic and serrano peppers and stir. Add the red bell pepper and onion and saute until they become tender. Add the chicken and cook until it is no longer pink. Push the veggies and chicken to the sides of the wok. Pour the eggs into the middle and cook until no longer wet. Stir in the oyster sauce mixture and saute until all of the ingredients are evenly coated. Add the cooked rice to the skillet. Stir and cook until all of the ingredients are well combined, about five minutes. Add the chopped basil and top with cilantro. Using the best ingredients to cook and bake for your family is essential. 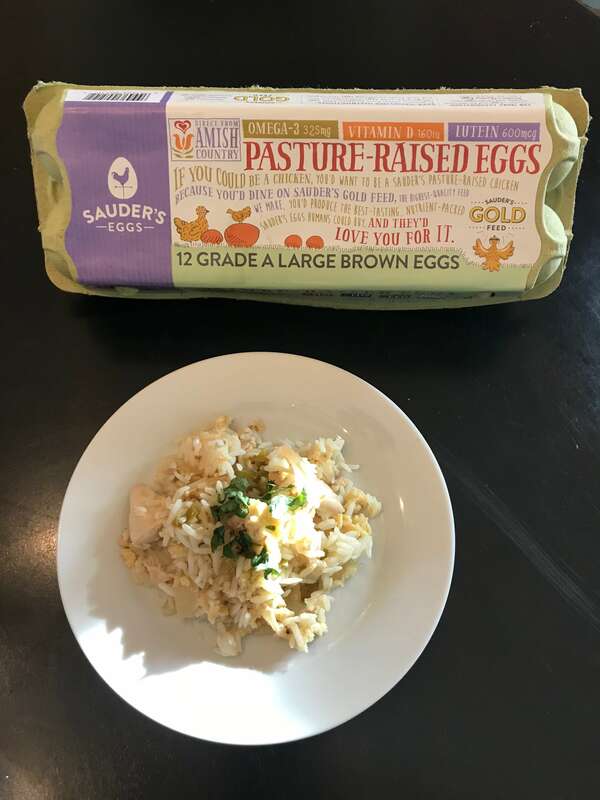 When you use Sauder’s eggs, you never have to worry about quality. We care about only providing the best and freshest eggs for our customers. To find our top-quality products at your nearest shop, check out our store locator soon!